We are dedicated to the treatment and prevention of Vascular Disease. Our patients always come FIRST, and we will consider all treatment options, including non-surgical or minimally invasive endovascular alternatives to surgery. 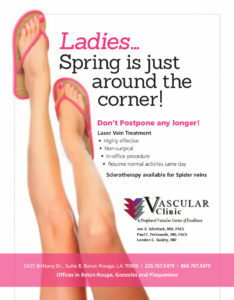 Our state-of-the-art clinic is run to bring you the best possible vascular care. Please also visit the General Resources page for more information on vascular medicine. The Vascular Clinic has partnered with Vascular Lab, a full-service laboratory operated by Registered Vascular Technologists. Together, our groups offer the best care for patients.